Below we have highlighted a few of our projects. 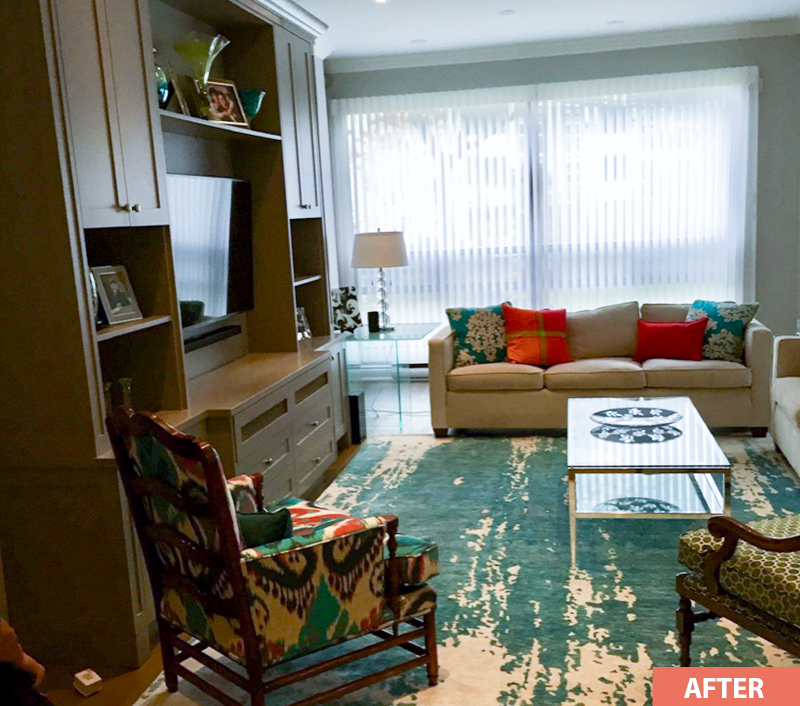 This client wanted a total change from her home when downsizing to a condo. She wanted colours she loved to be done tastefully, yet fun. 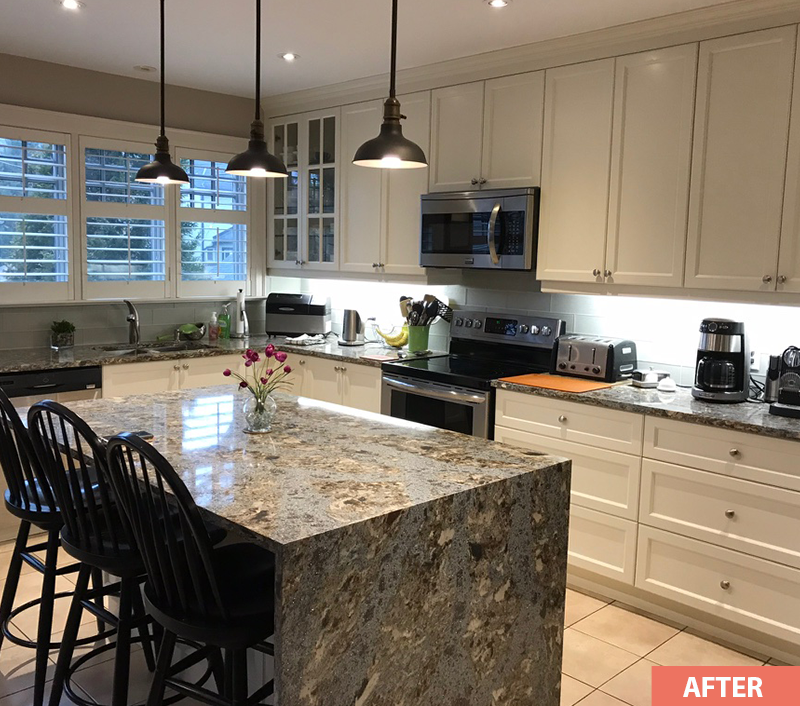 We removed the kitchen wall to create a more open concept; custom built a living room cabinet in soft grey taupe, matching the tones of our neutral colour palette for the custom kitchen cabinets and backsplash. 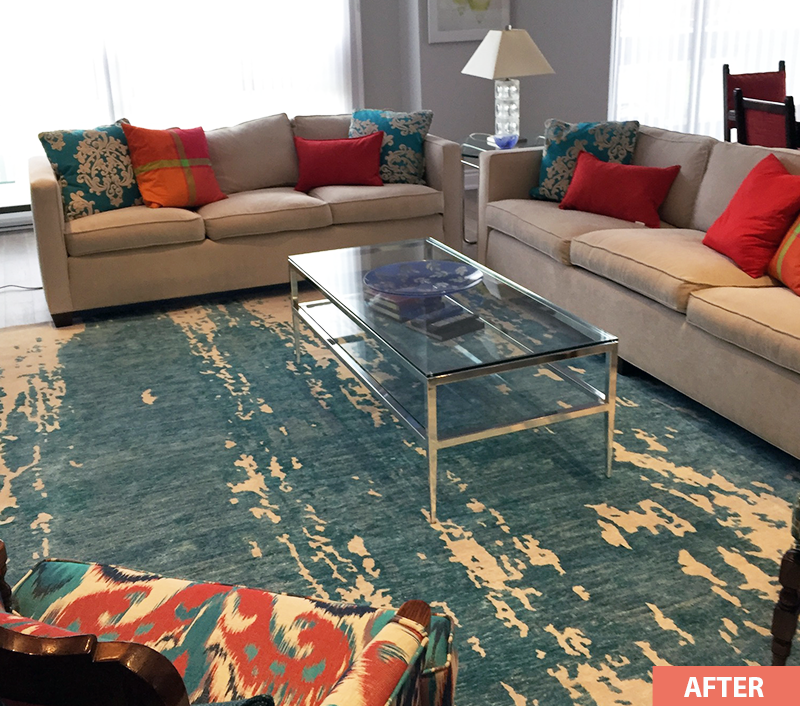 Finally, we customized and reupholstered her existing furniture pieces. 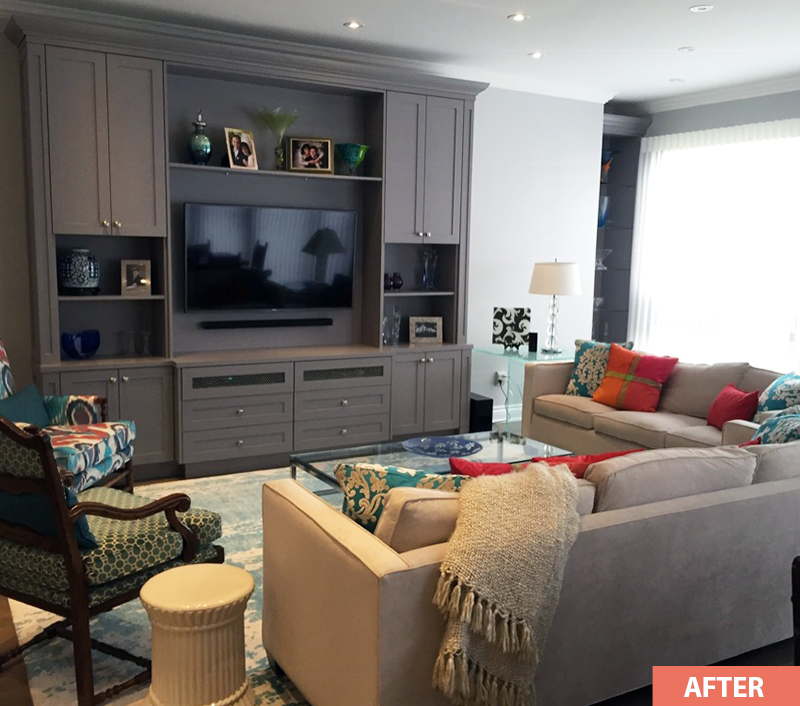 She loved her new home with a neutral palette and explosions of colour! 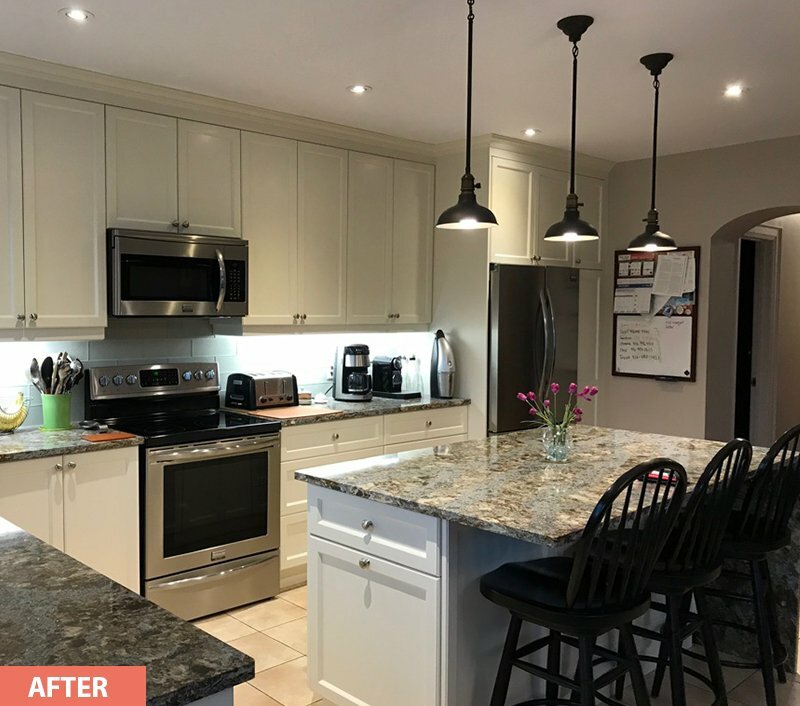 This client wanted a kitchen update without the full expense of a total rip out. 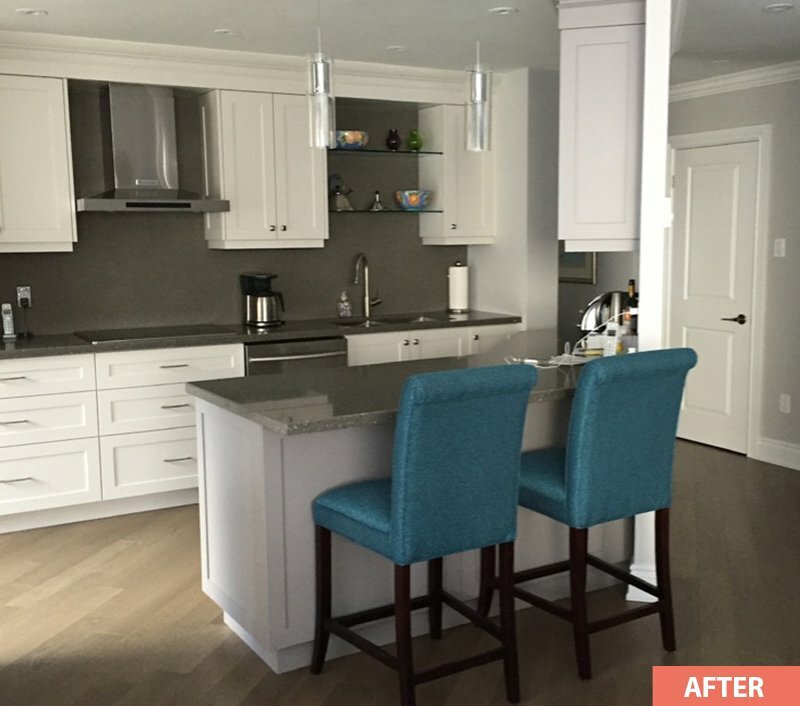 We had the cabinets painted professionally, by removing all the doors and drawer faces and painted off-site. The balance of the kitchen was sprayed on site. 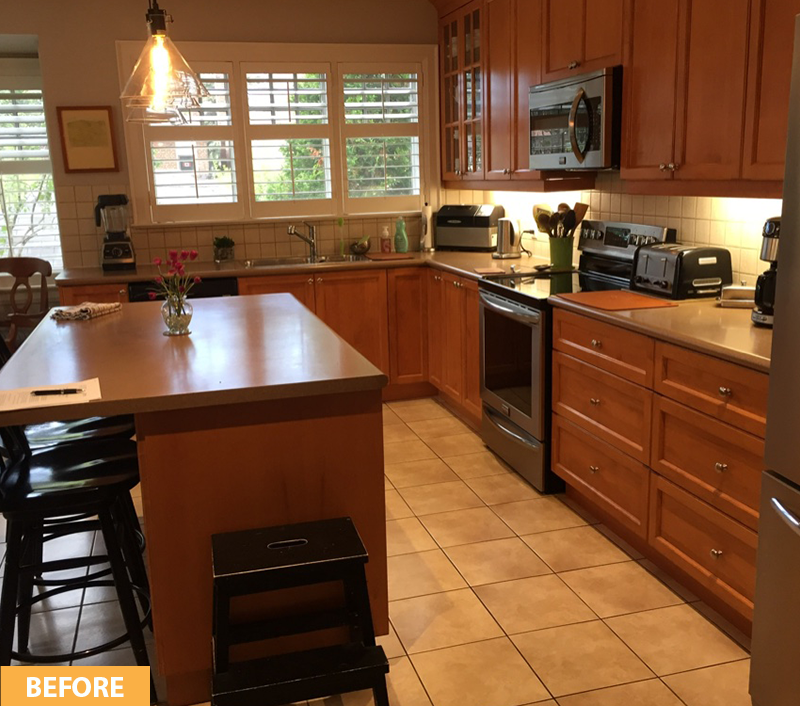 New quartz counters and glass backsplash completed this kitchen, working with existing elements in the room. Our client was in love with the update! 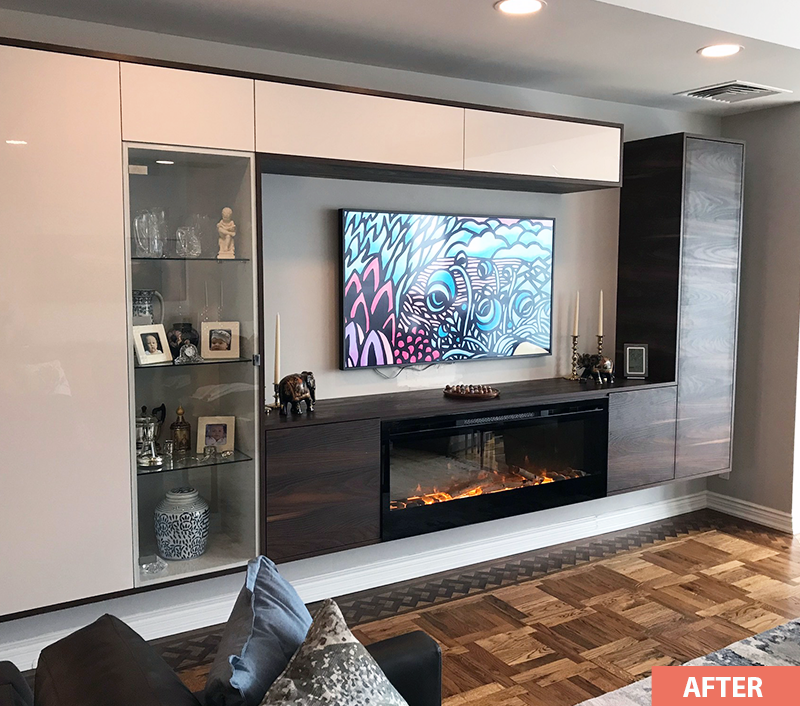 These clients wanted a unique piece that would provide storage with a TV and Fireplace. 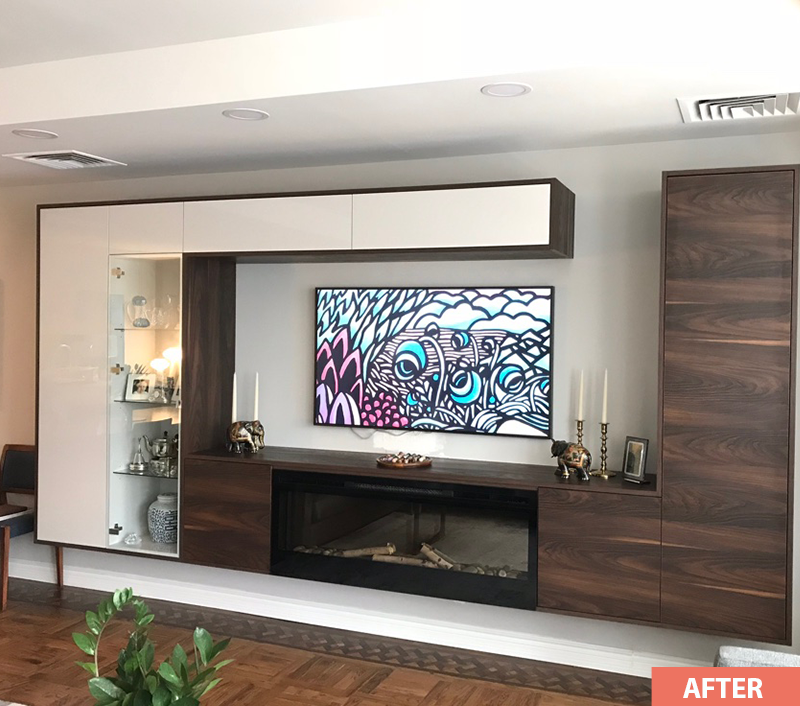 We mixed high lacquer finish with a beautifully grained wood to compliment existing wood and wowed them with this beautifully finished piece. 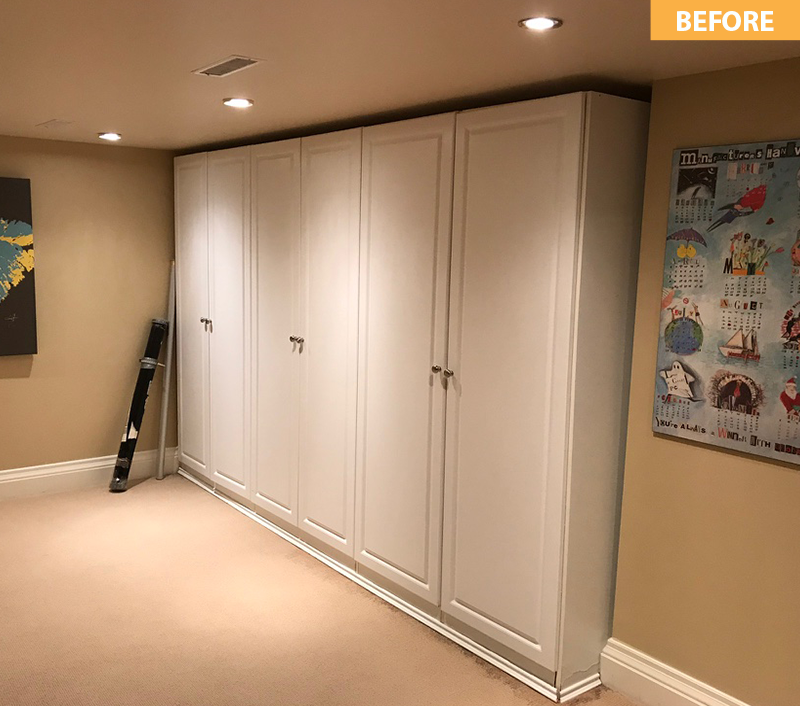 This room was designed for a young teenager and her first grownup room. 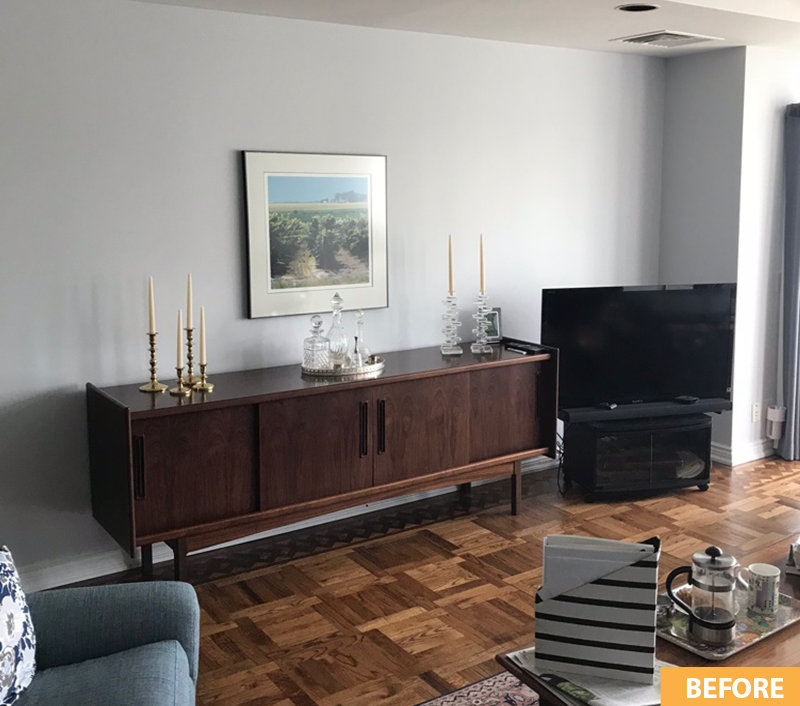 We customized the furniture in a soft grey tone, as this gal wanted simple. 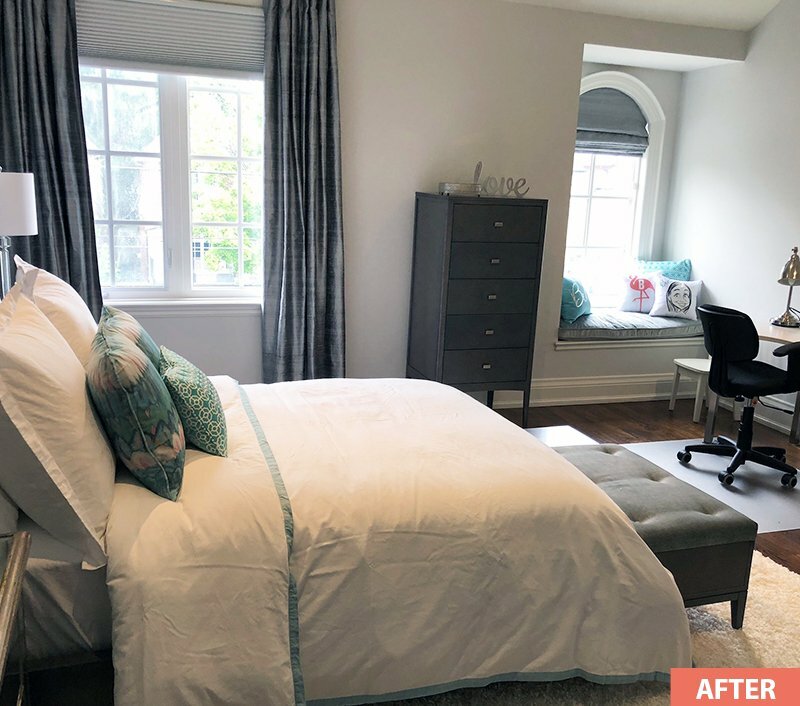 Matched the silk custom draperies and Roman blinds, to the soft green-blue velvet used for the headboard, stool and window seat. 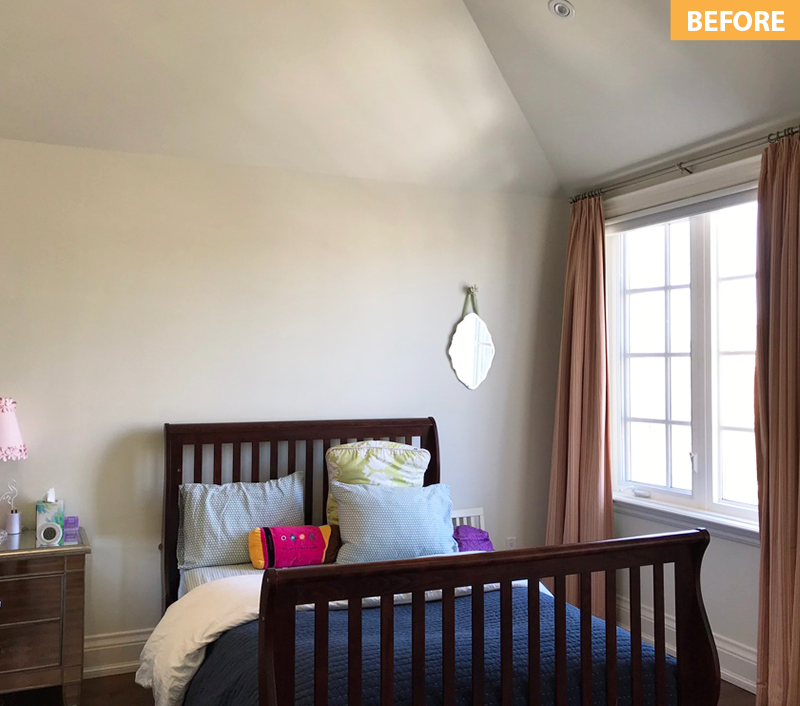 The room was painted in a soft gray,​ with a blue-green accent wall behind the headboard. 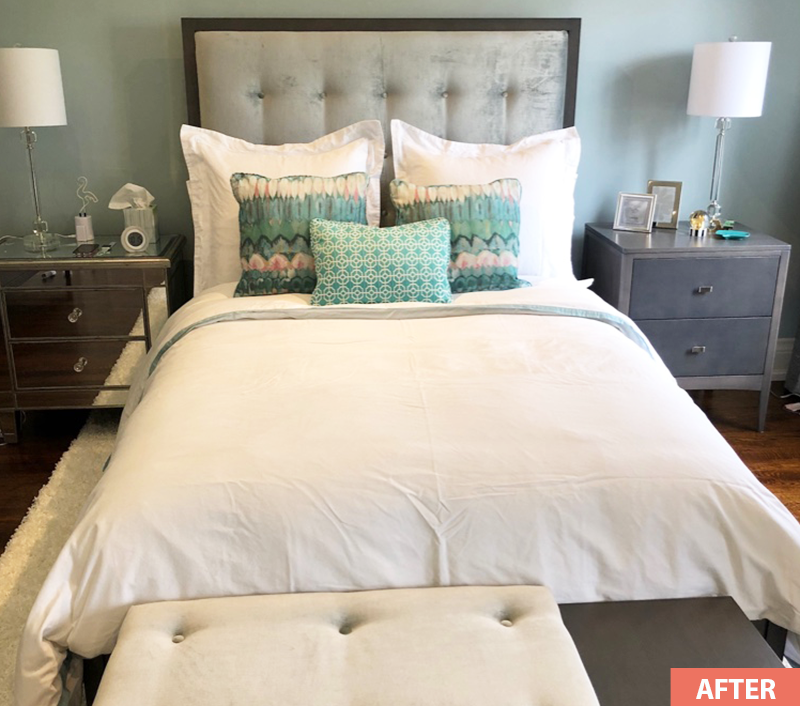 Complimentary bedding with soft accents set the scene for a beautiful relaxing bedroom she can enjoy for years to come. Our young client was over the moon! 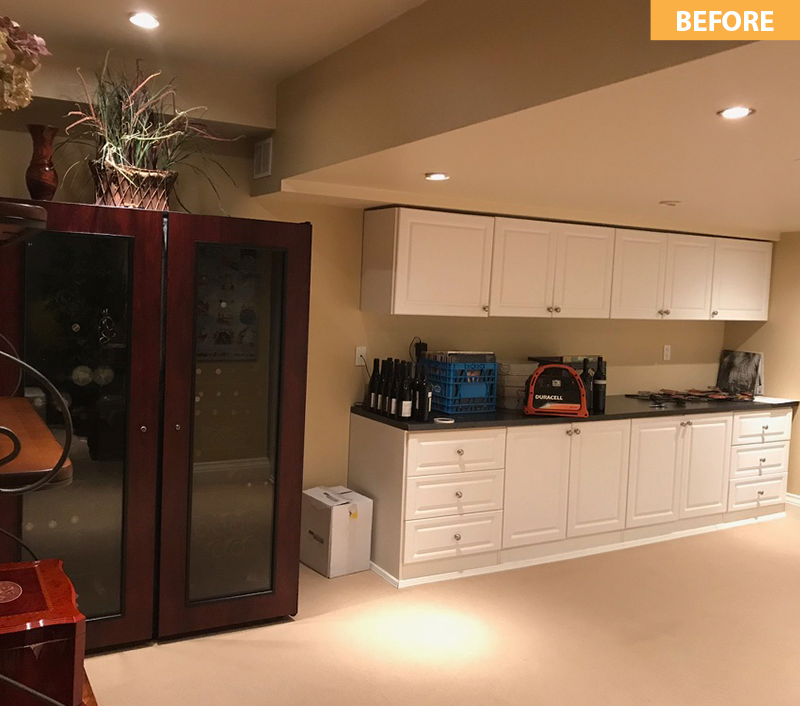 This was an unused area in the basement which the client wanted to create a more functional space. 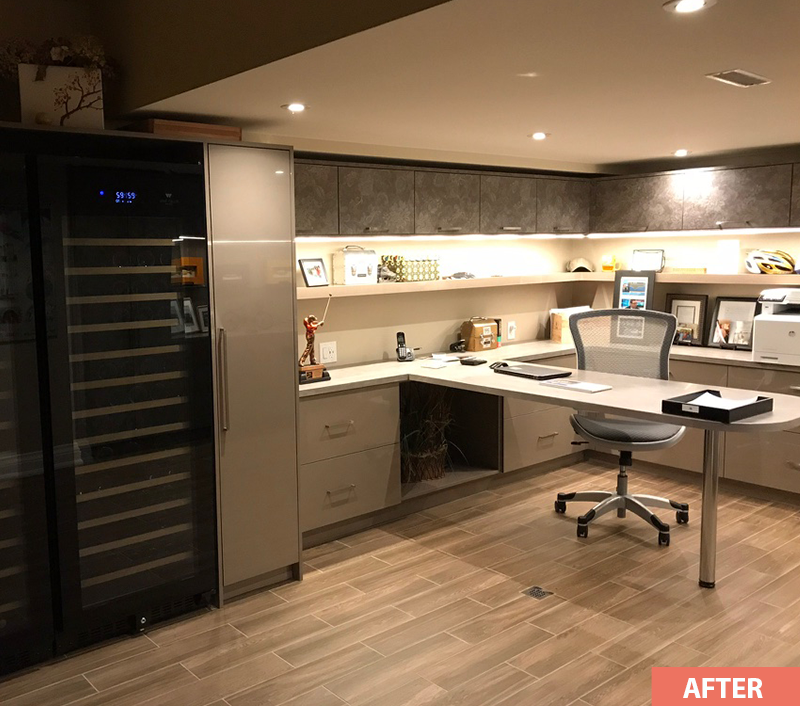 We turned it into an office with the addition of two built-in wine fridges. 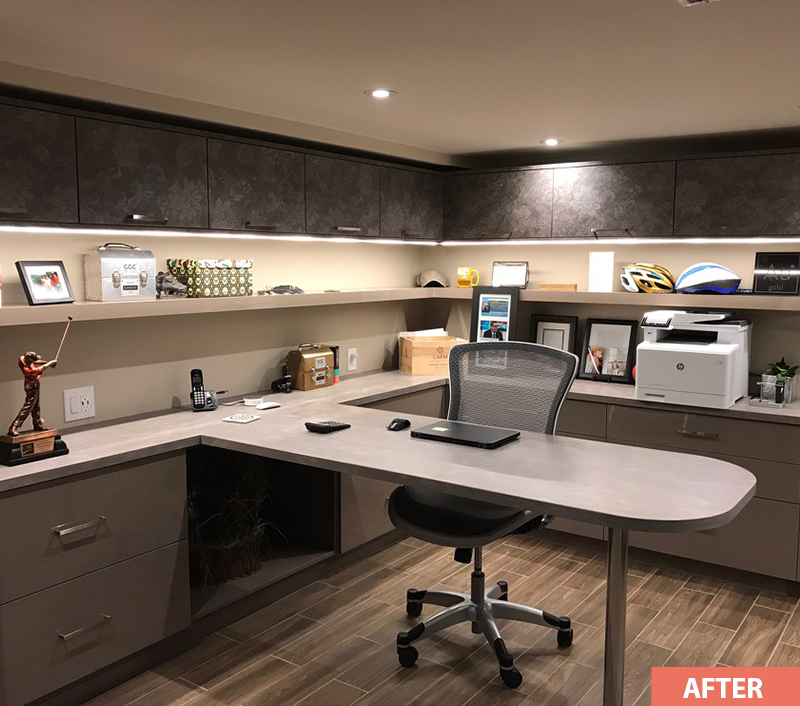 We used two-tone laminate with a high gloss on the bottom and a traditional print on the top and side cabinets, adding interest to complete the job. 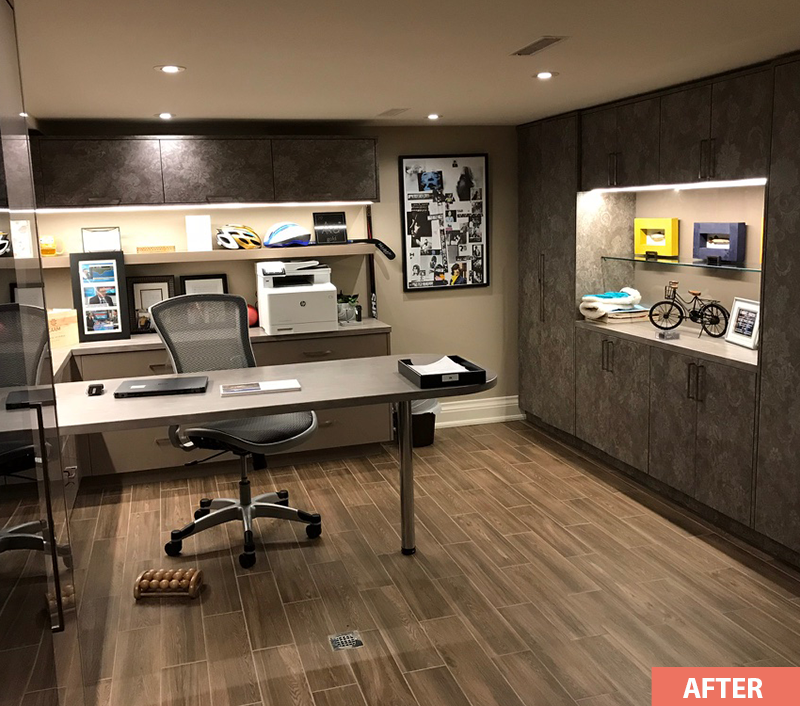 Corion counters for function, and porcelain wood like tiles over a heated a floor for comfort in a basement room, creating texture and warmth to balance out the finished look. I have worked with Garna on two occasions. 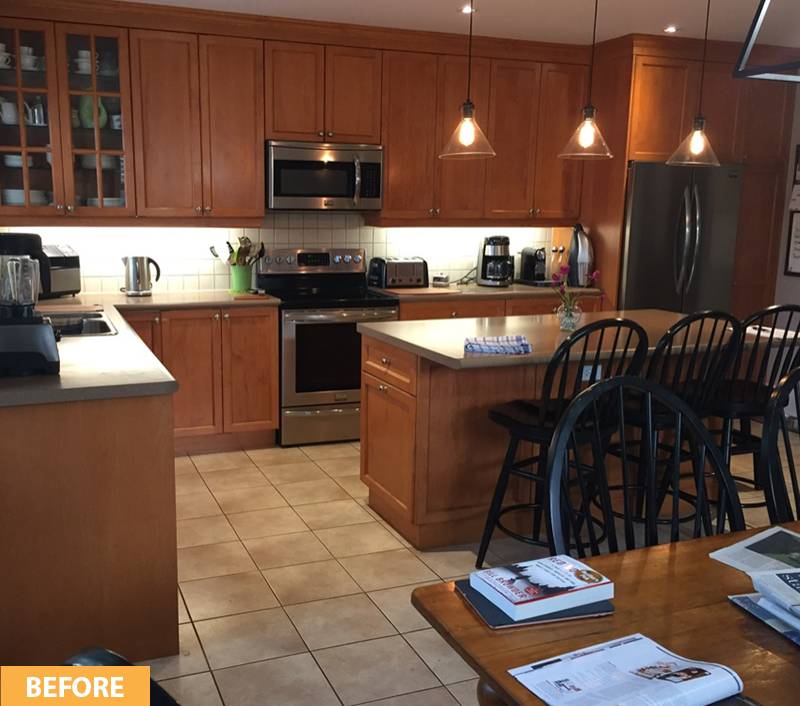 The first was a major renovation of a 3-bedroom condo and we did everything. New kitchen and bathroom cabinets, counters, hardwood floors, furniture, linens, window coverings, paint. We started from scratch. It was wonderful to have her as my guide through the process. I loved how she would bring me to a store and already have things narrowed down for me to pick from. Her sense of colour is unbelievable. She picked colour palettes I never would have thought of and they worked brilliantly and, I still love everything. To this day, I walk through my front door and I still love looking at it and I feel great pride in it. 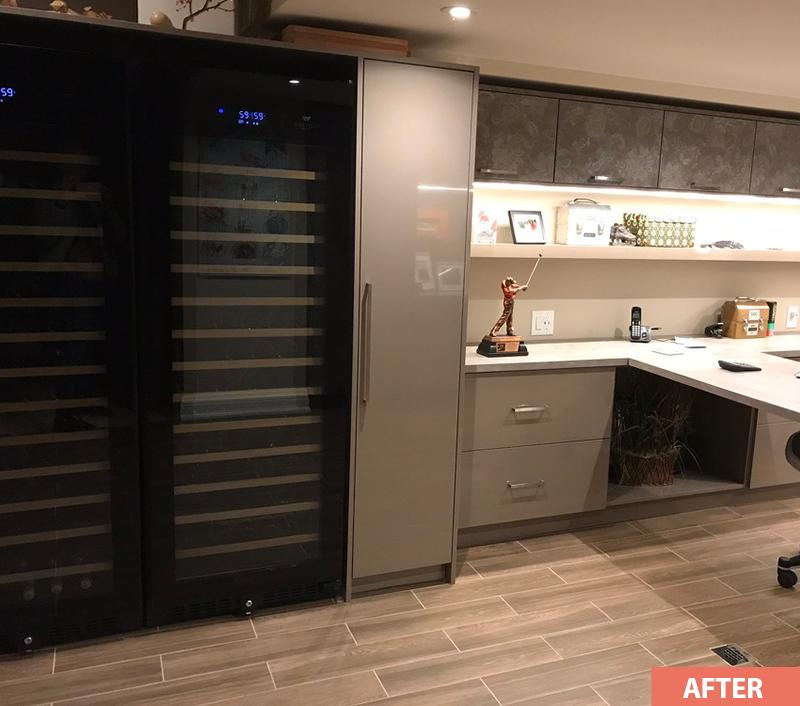 Recently I worked with Garna on replacing the tile floors and renovating a walk-in shower and once again, it all just came together seamlessly. I wouldn’t hesitate to recommend her and I have to family and friends. Thank you, Garna!